The topic for discussion today is the state of the US labor market: how we got here and why. I'm going to take a longer-term view, examining data from 2000 on, and using Canada as a benchmark. First, let's look at private sector employment by sector in the US economy, in the first chart. The chart shows employment across four sectors: services, manufacturing, mining and logging, and construction. 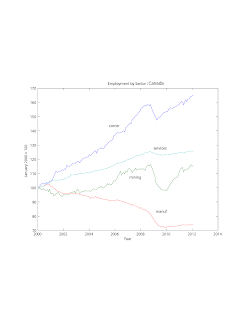 Clearly, over the period from 2000 to 2012, there was a significant sectoral shift in the composition of employment. Employment grew in services and mining and loggging, and shrank in construction and manufacturing. There was a huge drop in construction employment from the peak of the housing boom in 2006. From the trough in the recent recession, employment in services and manufacturing has grown sluggishly, employment in mining and logging has grown at a high rate, and construction employment has been essentially unchanged. Of course, it is also important to take account of the employment shares for each of the four sectors in the chart. The majority of employment throughout the period in question was in services, with services employment increasing from 65% of total employment in January 2000 to 70% in April 2012. Over the same period, employment in manufacturing fell from 13.2% to 9.0%, employment in construction fell from 5.2% to 4.2%, and employment in mining and logging rose from 0.5% to 0.6%. If we were to try to explain what is going on in the first chart, what would leap to mind? First, the secular shift from manufacturing to services employment is well-known. Part of this is due to changes in demand - preferences have shifted from tangibles to intangibles. Some of it is due to changes in technology - there seem to have been significant productivity gains in manufacturing relative to services, although productivity in the services sector (e.g. financial services) is notoriously hard to measure. Second, the behavior of construction employment sticks out like a sore thumb. The increase in construction employment from 2000 to 2006 and the subsequent crash were driven by well-known incentive problems in the market for asset-backed securities, followed by the collective realization that asset-backed securities were not so well-backed. 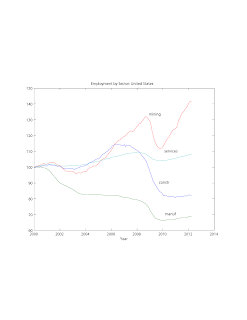 The second chart shows employment for the same four sectors, except for Canada instead of the United States. In this chart, the pattern of growth in employment in services and manufacturing looks very similar to the US. The share of services employment increases from 70.8%% in 2000 to 74.1% in 2012, with the manufacturing share falling from 16.5% to 10.2%. Construction employment looks much different in Canada though, with very strong trend growth throughout the sample period, and a quick recovery from the trough of the recent recession. Employment in mining and logging may look different in Canada and the US, but if we separate mining from logging, Canada and the US look similar, though Canada has a larger share of total employment in mining and logging than does the US. The North American economy is highly integrated. Aggregate economic behavior in Canada and the United States has followed a similar trend, and business cycles in the two countries have been highly synchronized. 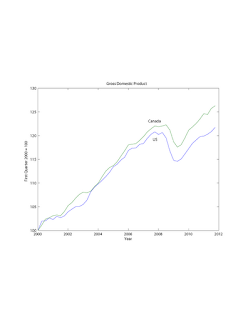 The Great Depression was similar in Canada and the United States with regard to the behavior of real GDP, as was the case in the recent recession. However, the above two charts tell us that it may be difficult to reconcile the behavior of sectoral employment in the two countries with some conventional aggregate-shock model of the recent recession. 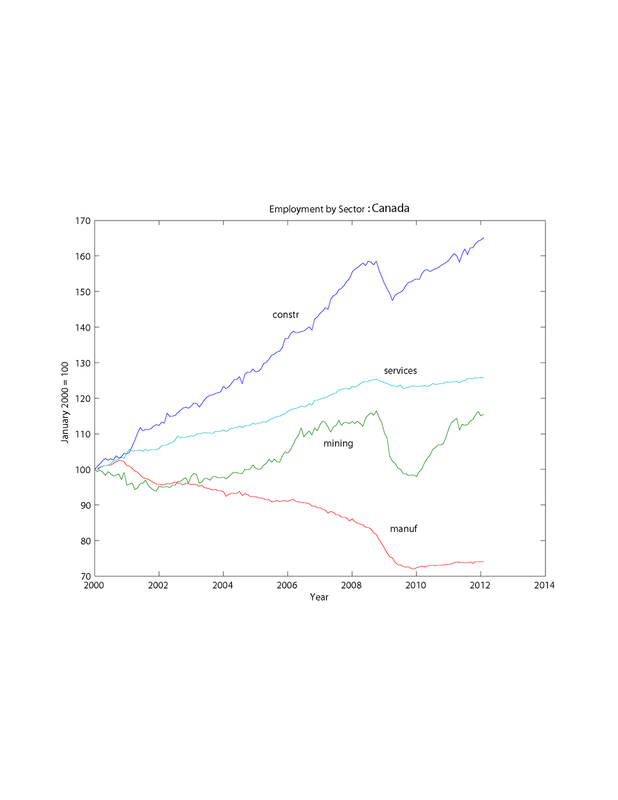 How could such a model explain the differences in the behavior of construction employment in Canada vs. the US? 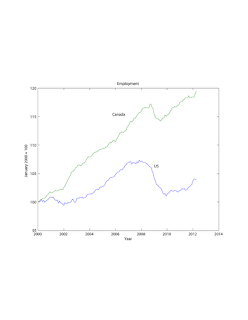 The aggregate labor market data for Canada and the US is especially interesting. The third chart shows total employment (from the household surveys now) for Canada and the US. Over the 12-year period in the chart, Canadian employment grew by about 19%, while US employment grew by about 3%. 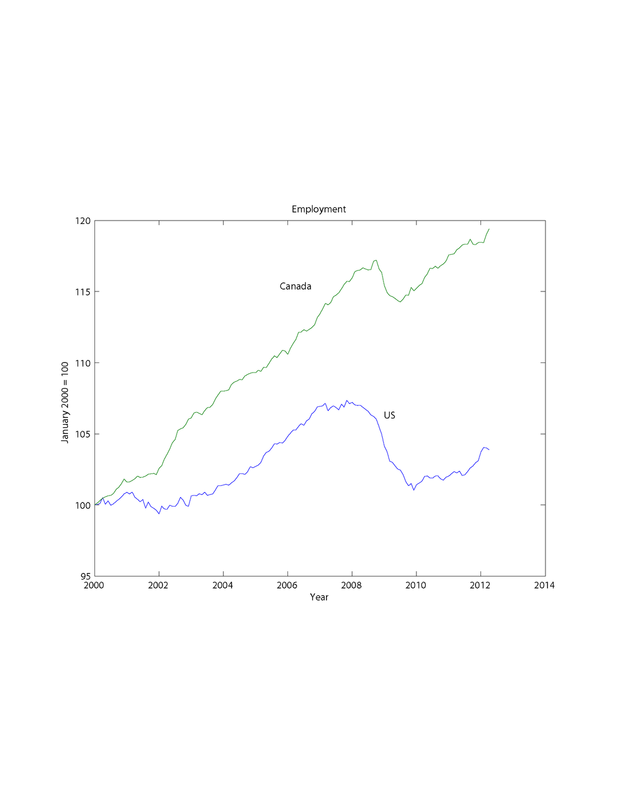 The drop in employment in Canada during the recent recession is quite modest relative to the drop in the US. The fourth chart depicts labor force participation rates in the two countries. This one is quite remarkable. First, the decline in the participation rate in the US that began with the recent recession is just part of a trend decline since 2000, which was interrupted for the period from the end of 2004 to the beginning of 2008. While the US participation rate declined by about 3.5 percentage points from 2000 to 2012, the Canadian participation rate actually increased by a percentage point. The fifth chart shows unemployment rates in Canada and the US. Historically, the Canadian unemployment rate was typically higher than the US unemployment rate, due to more generous unemployment insurance system in Canada, and sectoral and geographical differences. During the recent recession, however, the unemployment rate in the US rose by about double the increase (in percentage points) in Canada. If we took account of measurement differences in Canada and the US, the current difference between unemployment rates would be even larger than it is in the chart. 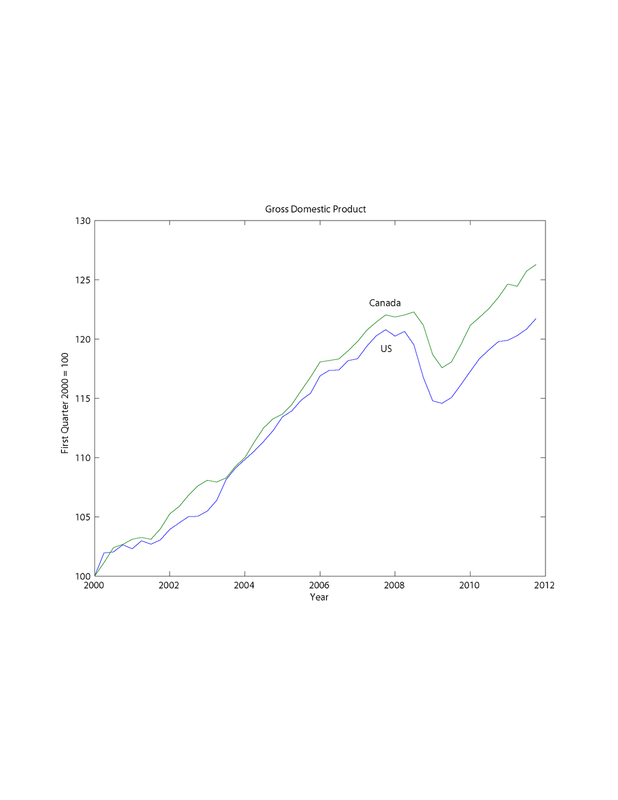 In the sixth chart, we show real GDP in the US and Canada. In this chart, a key observation is that the recent recession was of similar depth and duration in Canada and the US. However, the recovery in Canada has been somewhat stronger, and at the end of the sample period real GDP was 3.8% higher relative to US GDP than it was in 2000. Putting together real GDP and employment paths, we get the final chart, which shows average labor productivity in Canada and the US. 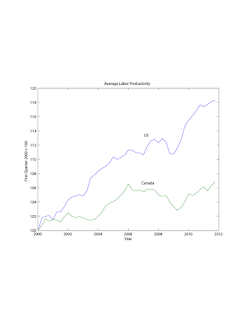 Here, a large gap had already opened up between US and Canadian productivity, and that gap increased significantly during the recession. What are we to make of all this? I don't know about you, but the Keynesian narrative does not help me to make sense of what I'm seeing. If employment and labor force participation are so low in the US because wages and prices have been stuck for the last four years, and aggregate demand is insufficient, then we should be seeing the same phenomena in Canada. Canadian wages and prices can't be any less screwed up than are US wages and prices and, if anything, fiscal and monetary policies have been more "stimulative" in the US than in Canada. Further, according to Keynesian logic, it's essentially the same aggregate demand north and south of the 49th parallel. So why are the Canadians working so much more than the Americans? Before the financial crisis, some of us liked to pay attention to financial factors, credit, banking, monetary economics, etc. Now we all know that those things are important, right? If you think about them, you can indeed begin to make sense out of the data above. The Canadian financial system essentially sailed through the financial crisis unscathed, save for a few bruises perhaps. The problems in US mortgage markets, which acted to foul up financial exchange and credit in general, are reflected in the performance of the US construction sector, and in US labor market performance, in ways that we have not yet been able to successfully quantify. There may be inefficiencies associated with these phenomena that can be corrected through the better design of fiscal and monetary policies, but it is far from obvious what the inefficiencies are, or what the correct policies are. Anyone who tells you they are sure of the answers is fooling themselves, or fooling you. "If employment and labor force participation are so low in the US because wages and prices have been stuck for the last four years, and aggregate demand is insufficient, then we should be seeing the same phenomena in Canada." You seem to think yes, but is Canada really that similar? I remember a maybe a year ago you had a chart showing home prices in the US and Canada. They crashed in the US, but NOT in Canada. Maybe Canadian home prices started out a lot more affordable in the US, so they've been able to rise greatly and stay there (at least so far). But housing crash in the US, with tons of people being underwater, and getting foreclosed, and going bankrupt, but this not happening in Canada, seems to be a big difference between the US and Canada. One that seems to go with a Keynesian explanation. Housing price crash => foreclosure, bankruptcy, loss => less spending, less aggregate demand, and prices take a while to adjust in a way that will restore aggregate demand, and it takes a while for people's balance sheets to be repaired so that they start spending again. While in Canada, no housing price crash, so none of this happens. A Keynesian might say yes housing credit played a role, but as a catalyst for decreasing aggregate demand. But now that the aggregate demand is here we should deal with it (and with problems with the catalyst too). Before the goons start with their venom, please try considering the fact that it would be a whole lot more constructive if you would just explain clearly why this is wrong (if it is). You hurt learning if you discourage questions, and the getting out of wrong ideas (if they're wrong), so it can be cleared up why they're wrong. Otherwise, people just sit there silently with their wrong ideas, for fear of goons, and they never get cleared up. You help learning if you just explain why wrong things are wrong and answer questions. "But housing crash in the US, with tons of people being underwater, and getting foreclosed, and going bankrupt, but this not happening in Canada, seems to be a big difference between the US and Canada." Yes, I know, so it's finance, credit. Keynesians like Krugman don't disagree on that, and the need for better finance regulation. The question is, finance started it, but did it now cause a plunge in aggregate demand, and should that be treated too? Heavy smoking may have caused your tumor -- we don't disagree, but now you have the tumor; just quitting smoking alone at this point won't be enough. You also have to treat the tumor, with, say, an operation to remove it. Don't go for the bad medical analogy. Use economic reasoning. Ok, honestly, I'm not completely convinced of Keynesian explanations, certainly not in a mathematical proof way, and I wish I could find more time to really study this stuff. But you don't think the financial problems could have been a catalyst that led to now other problems, like a demand slump, the way that bad brakes led to you hemorrhaging on the side of the road? Yes, the brakes should be fixed, but you should also provide medical care for the hemorrhaging and your dangling spleen. When someone says "demand slump," that can mean different things. They might mean that there is some multiple equilibrium phenomenon at work. They might mean that relative prices are screwed up. They might just have received bad economics instruction. Sometimes it's hard to tell. "prices take a while to adjust in a way that will restore aggregate demand"
As the government has been trying to prop up housing prices - something the Fed has been in favor of - it is holding up adjustment. I think housing prices should have adjusted down greatly. They were crushing the middle class (see Harvard bankruptcy expert Elizabeth Warren's books "All your Worth" and "The Two Income Trap"). Fixed expenses went from about 50% of after tax income to about 75%, leaving families little room for anything going wrong, and there's a whole lot that can go wrong in today's very risky America (see "The Great Risk Shift", from Yale political scientist Jacob Hacker). 1) Inventories eventually run down a lot and must be replaced. 2) Capital eventually wears out en masse and must be replaced. 3) New technology comes along and creates optimism, and an incentive to produce it. But I'm telling you what I've read; I'm open to reasons why it's wrong, and if they're good I'm hoping to hear them. Stephen, interesting post. Your conclusion, if I understand it correctly, is that there was a large, real shock to financial intermediation (or to "commitment") in the United States but not in Canada. And, as a result, the U.S. financial system is not able to produce sufficient amount of safe assets. The obvious solution for the safe asset problem, one that you have mentioned before, is to create more treasuries. An alternative is to somehow radically change market expectations (ala Roger Farmer style)so that there is a marked improvement in economic outlook. Doing so would decrease the demand for safe assets while at the same increase production of them by financial system. I think a NGDP level target committed to restoring aggregate nominal spending to some pre-crisis trend is can do just. It is capable of radically changing expectations. 1. I don't think it was a "commitment" shock. More like an information shock: Oh, these assets will not yield the payoffs we were expecting. But unfortunately those assets were supporting a large quantity of credit and exchange. 2. There is certainly a shortage of safe assets, and the continuing sovereign debt problems in Europe don't help. Of course "creating more Treasuries" is a problem for fiscal policy. I haven't noticed any creative solutions coming out of the US Congress lately. 3. Farmer's framework is fundamentally about indeterminacy. I think he believes that policies like quantitative easing can somehow pick out good equilibria. I'm not convinced. 4. I understand you think that NGDP targeting is a panacea. As with Farmer, you have not convinced me. I think that commitment to some coherent policy framework is important for the Fed, but I have no idea why NGDP targeting would somehow give us good results relative to any other simple policy rule that has been tried in the past. Further, as far as I know, no one has laid out clearly how NGDP rules are supposed to be implemented. What happens under channel systems and floor systems, for example? peak to trough change in us construction employment was 2.2 MM, but peak to trough change in total nonfarm was 8.7 MM. To date, construction employment is still down 2.1 MM, while we are still 5 MM below peak employment. Looking at is sector by sector, The unemployment level among those with some college is still 1.4 MM higher than the previous peak in 2003 (the UE rate is still much higher), in service occupations unemployment is still 50% higher than the previous peak. I could go on: drilling down into specific sectors by industry and education, employment has not recovered and construction explains at most 50%. You can't look just at the construction sector, as there are spillovers. For example, a new house is not just a piece of residential investment. Someone buys it using a real estate agent (services), and then fills it with consumer durables (manufacturing). I talked to someone who had done some simple calculations using input/output tables (I think this was someone at the St. Louis Fed), and he seemed to think you could somehow explain most of the drop in aggregate employment. As well, there are the financial linkages. Mortgage debt using houses as collateral is sold and packaged as mortgage-backed securities, which are then traded as "safe" assets in financial markets, and used as collateral. Ultimately, a small quantity of housing stock could support a large quantity of credit, since that housing stock has been used multiple times as collateral. Small drop in housing construction implies a large drop in total employment. pt 1- fair enough. I do not agree with your analysis regarding the housing sector, and in particular your last two sentences. To cancel a mortgage debt contract costs a lot (most Fed studies put the cost of default at ~50% of the home value). Better to think of a (nominal) debt contract as an extreme sticky price contract for 30 years worth of housing with a 50% cancellation fee. "housing demand" per se was not the issue: rental demand is actually quite strong. Better to think of the wacky price/rent ratio as a shift of the relative price of owner-occupied vs rentals due to stupid lending standards (not all defaults are caused by poor lending standards, some are caused by cyclical UE). People still have to live somewhere, when they default they are moving into a rental. As these very sticky debt contracts reset you will see a rebound in construction (at new lower prices, just as you would predict in any sticky price model). It just takes a very long time to reset debt contracts (for example the average house is in foreclosure 700+ days). We are about 1/2 way through the debt reset process: you are starting to see a national rebound and home construction, and for example home sales in Las Vegas has surpassed previous peaks (sales in 2011 were at record highs, prices off 62% - as you would predict when demand rebounds as sticky prices reset). Cyclical unemployment is the *primary* driver of delinquencies (again, lots of research has been done on this). For example, 70% of fannie/freddie loans whose LTV is 115-150% are actually current (the cost of default is quite high, else they would just leave and accept the lower rental payment). It's only when people *cant pay* that they stop paying (or when home prices drop well to the point where it makes sense to default). look up the "dual trigger" in the fed research, lots has been written. As unemployment drops, delinquencies also drop (and vice versa). Right now, delinquencies are about 90% correlated with UE, and are still running 2x normal. high defaults / delinquencies = safe asset demand. as UE drops and delinquencies drop, the asset demand will return to normal levels. I dont see "more" credit creation than the value of the underlying collateral (at new lower prices). Housing is not used "multiple times" as collateral. bank leveraging is directly linked to high UE. 1. regulate mortgage finance to prevent it. 2. the Fed should have payed more attention to the gdp deflator and less to the PCE IMO during the 2003-2008 period. cheap imports depressed the PCE early, then expensive oil pushed it up in 2008. The Fed cannot control import prices and should only focus on the price of domestically produced goods. policy would have been tighter, earlier. 3. Don't respond to supply shocks (aka a relative price distortion) with monetary tightening. 4. in particular, don't respond to a supply shock where which impacts the value of a lot of banking collateral, that triggers a cyclical debt-deflation spiral. now, i agree that ngdp targeting is not a panacea, however I think its wrong to think that the Fed will hit ngdp all the time (it does not hit PCE either). path level targeting is a commitment to fix it's errors, and it would have resulted in slightly tighter policy during 2003-2006 timeframe which might have avoided the crash. It's just a better version of the balanced taylor rule (with the GDP deflator, see above). Since we all think the primary way the Fed works is by setting expectations, i dont understand your question about implementation and channels and floors - why would it be different than how it works now, its just setting a more comprehensive goal for itself? it also makes the fact that the Fed is consciously offsetting fiscal policy very transparent (which a lot of people don't get). I like clarifying the fiscal picture for Congress very much. 1. Yes, it's costly to work out defaults. That's true for all debt contracts, not just mortgage debt. 2. Not sure why you think the nominal debt contracts are important for what you have in mind. 3. "Housing is not used "multiple times" as collateral." The house is used once as collateral by the homeowner to get the mortgage loan. Then, suppose that mortgage is sold and packaged as a mortgage backed security (MBS), which is then held as an asset by an SPV, which finances the portfolio by rolling over overnight repos. That's using the house twice as collateral. But the MBS can be used multiple times through a process of rehypothecation. Theoretically, there's no limit to how many times it can be used. Thus, one house, used to support multiple credit contracts. 3- "Thus, one house, used to support multiple credit contracts." sorry we were talking past each other here. yes, i agree with your concern. However, the only way i know how to judge how credit creation and intermediation etc is affecting the economy is to look at nominal aggregates. Therefore I see ngdp path level targeting (NGDPLT) as an important safeguard to prevent excess credit creation from overheating the economy (any excess growth in period t is offset in periods t+1...t+4 so that the 5-year average is on target). 1+2: You said: "If employment and labor force participation are so low in the US because wages and prices have been stuck for the last four years, and aggregate demand is insufficient, then we should be seeing the same phenomena in Canada." I am saying: no, the relevant "sticky price" - for US construction in particular - is essentially the rental prices imputed in outstanding mortgage debt (which is the cost of owner-occupied housing). If a homeowner has a 120LTV loan that they took out in 2008, that is *their* cost of housing for the next 30 years (and sure they'd like to lower it because prices dropped, but they can't, that's the price they agreed to pay). You cannot really compare Canada, prices did not drop so much. There are still a lot of homeowners with "above market" housing contracts: In the US, foreclosures and delinquencies remain high, so demand will not return to normal until the mortgage debt workout process is completed. To understand the true "structural" picture, ultimately, look at demographics not Canada (lots of Fed papers here too and housing research). The demand for housing (rental + owner-occupied) is driven by demographics. The population of 20+ year olds in the US has grown ~15 million since 2006 (about 2.3 MM/yr). New construction has averaged 700k for the last 3 years. Now, housing is not like ipads, people have to live somewhere. I love my kids, but I guarantee I will make the opportunity cost extremely high so eventually they will move out! New home construction remains low and most projections are for it to rebound to about 1 MM or so, once we get through the workout process. ... a good metric btw to judge how many "above market" housing contracts there are is to look at industry databases on loans. An estimated 25% of mortgages are underwater, which means there are a lot of "above market" house price contracts out there. "Therefore I see ngdp path level targeting (NGDPLT) as an important safeguard to prevent excess credit creation from overheating the economy"
See my reply to David above. What is "excess credit creation" and what do you mean by "overheating?" I know people use those terms all the time, but they have never made any sense to me. Good question, I would define "overheating" generally as the phenomenon where the economy loses its nominal anchor, inflation expectations become unanchored, etc. In a simple minded quantity theory money framework, much more P than Q. If the GDP deflator is too high, for example (relative to whatever you think the "right" level is). credit creation: I appreciate there are all sorts of near-money substitutes and intermediation steps etc. (I have worked in banking for many years at MegaBank and understand rehypothecation etc. ), but the process of "houses supporting a lot of credit and exchange" only bleeds into the real economy either through the price level or the goods market. "excess credit creation" means to me its affecting the real economy through the price level, not with higher real output. keep in mind: my experience is that people form expectations (with uncertainty), about both prices *and* quantities when for example business planning. So, yes I think the Fed can anchor them to steer the economy (I think it does that now). we can debate about the "right level" or path (3,4,5% depending on population and productivity growth) but in my mind what the Fed was doing up until about 2006 was pretty close to ngdp targeting, so i dont really see the case for some alternate equilibrium. ngdp targeting is in my mind flexible inflation targeting, plus error correction. and actually, I think the whole point about 2% inflation target is deflation-prevention. I think ngdp targeting does that much better, and reduces the need for that cushion, so 1-1.5% long run trend inflation is feasible. On what basis do you argue that "Canadian wages and prices can't be any less screwed up than are US wages and prices" ? "...despite an average increase of 0.33 percent in median real hourly wage in the United States, the gap between real wages and labour productivity annual growth was larger in the United States (1.40 percentage points) than in Canada (1.26 percentage points) between 1980 and 2005. Second, the increase in earnings inequality in the United States has been much more important than in Canada, in both absolute and relative terms"
Actually, I would find it hard to make the case that wages and prices are screwed up in either Canada or the US, in the way that a New Keynesian might think they are screwed up. In the paper you link to, there seems to be a particular view about labor market distortions. I couldn't make much sense out of the passage you're quoting. "Actually, I would find it hard to make the case that wages and prices are screwed up in either Canada or the US, in the way that a New Keynesian might think they are screwed up"
what sense is that? your argument appears circular. i have seen other analysis for example that construction wages in FL and NV have not dropped all that much (appx $20/hr). Now at some point either there are labor market rigidities that prevent wages from adjusting downwards, or there are not. If there are not, surely there is *some* price at which demand (for example, for 2nd and vacation homes) picks up and therefore employment rebounds. I would buy 1 in each city if they were sufficiently cheap. Again, you have to look at total "housing" demand including the demand for 2nd and vacation homes. Overall though, i dont have to agree with your point about "structural" issues to agree that there is enormous uncertainty about "potential output" and I also would agree that given this uncertainty we would not want a repeat of the 70s where we consistently overestimated it. However, there is lots of literature that ngdp targeting performs better under uncertainty. A lot of the talk in Canada right now is about the fact that a lot of our growth is concentrated out West. Alberta has benefited from a natural resource boom. I wonder if you were to look at Ontario numbers what you would find? One could argue that the financial systems of Ontario and Alberta should be relatively similar. Therefore, if Ontario looks more like the US it may weaken the argument? Stephen -- can you offer any evidence that it's the financial sector which is holding back the housing sector now in the US, and not demand for housing? Secondly, to the extent banks are holding back the economy b/c they are sitting on cash, how does differ from the 'keynesian' notion that we're in a liquidity trap where banks are sitting on piles of excess reserves rather than loaning that money out. And how would more inflation not encourage these banks to make more loans? Lastly, a cheap shot, where is this hyperinflation you've been predicting?